ColorRite has been manufacturing the highest quality touch-up paint available for over 25 years, and take pride in providing the fastest shipping in the industry. Our products are designed for a superior color match and protection against the elements. Please note that the 2Tip Pen holds enough for very small areas only. We guarantee that our paint will match the ORIGINAL YZ/Z1 (2014) Oxford White of your 2014 Ford F-150. Performing a "spray-out" (a test application of the color on something other than your intended part) is critical to ensure that the color matches and you're applying coats as the paint requires. ColorRite is committed to your achieving results, staffing a dedicated team of specialists to support you. Our experienced team is committed and ready to help you achieve the best results possible. ColorRite â€" delivering quality for over 25 years. 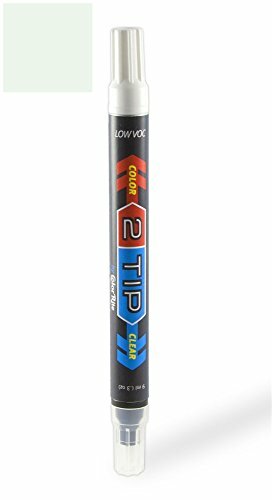 2Tip by ColorRite combines TWO Paint Repair Pens into ONE cost-effective solution for small touch-up jobs. One side of the 2Tip pen is your factory-matched COLOR; the other side contains high-quality CLEARCOAT. The Value Package includes one factory-matched 2Tip pen, a separate pen with primer, three Prep Wipes to remove wax and grease plus a pair of latex gloves. Formulated using low-VOC urethane means our 2Tip paint repair pens are 50-state compliant, with minimal environmental impact. Touch-up paint designed specifically for your vehicle. Please confirm that your vehicle's color code is YZ/Z1 before ordering. 2Tip touch-up pens are the easiest and best way to repair small nicks and scratches. If you have a stone chip, small nick, or fairly small scratch, the pen is ideal. It has a "chiseled nib" style tip has two edges; a thin edge for hairline scratches and a wide one for larger scratches. View More In Touchup Paint. If you have any questions about this product by ColorRite, contact us by completing and submitting the form below. If you are looking for a specif part number, please include it with your message. Dupli-Color EDE163807 Ceramic Cummins Beige Engine Paint - 12 oz.